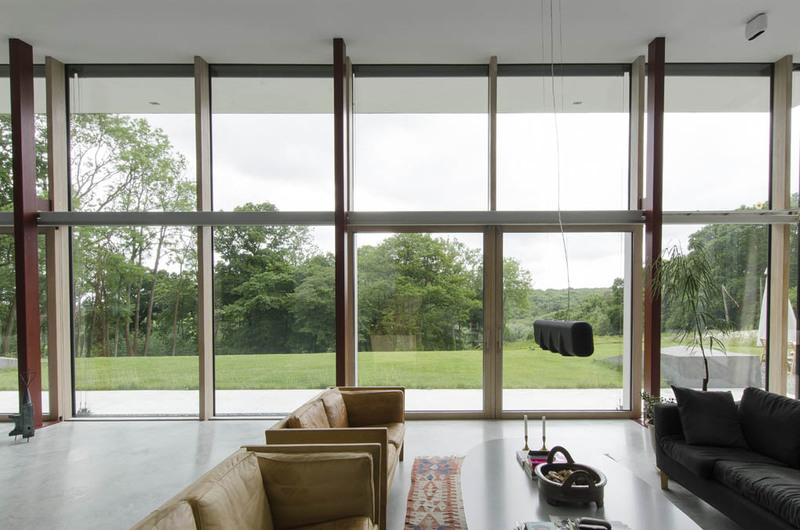 The project embeds a large family home into a beautiful site with views overlooking the rolling hills of an Area of Outstanding Natural Beauty to replace a tired detached 1950s country house on the site. 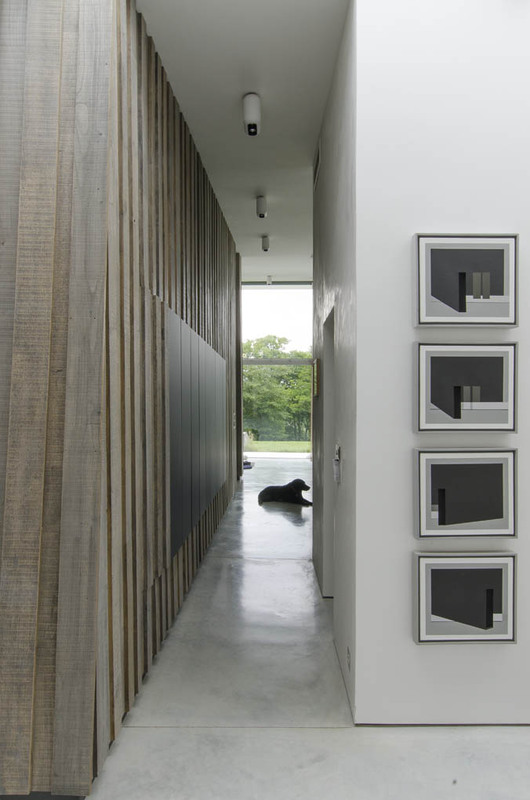 R2 STUDIO acted as executive architect and part of a team for designer and artist Ena Bodin, director of pioneering low energy design & build company Bodin & Nielsen who provided the concept design. The project was conceived on the basis of delivering a low energy, ultra-low impact building along PassivHaus standards. 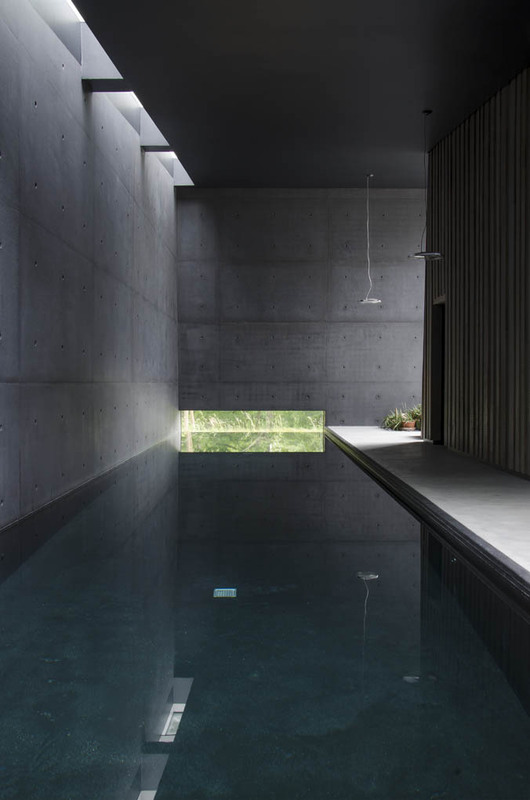 The brief of the owner was for a building, including an indoor swimming pool, that would be highly energy efficient and as carbon neutral as possible while providing a high level of comfort. 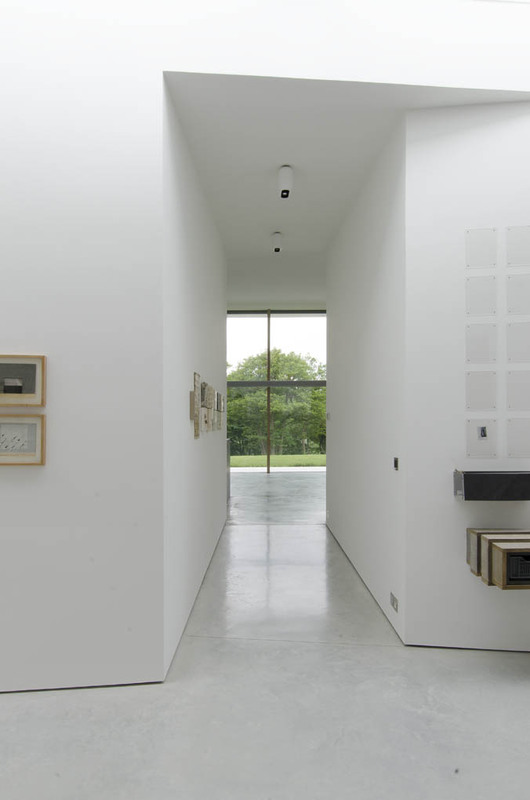 The project incorporates a family residence, an art studio and gallery as well as a swimming pool. 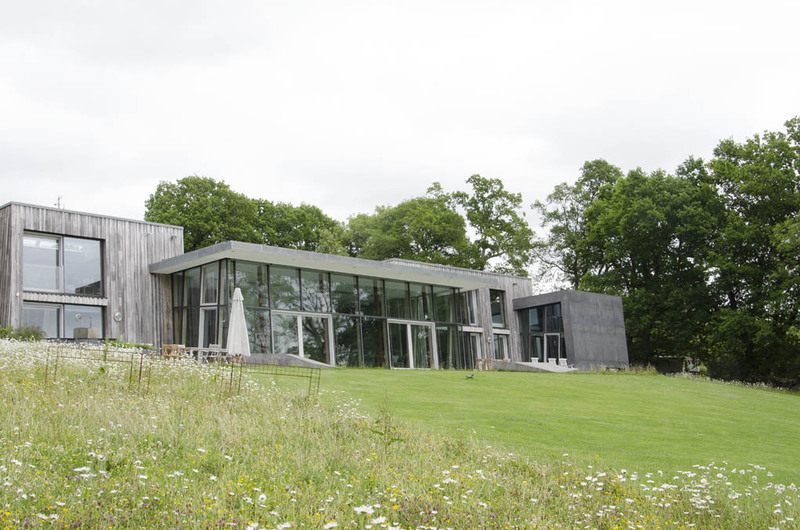 As the house is located in an Area of Outstanding Natural Beauty one of the key drivers of the design was to deliver a building that, whilst contemporary, sat within the landscape reflecting the surrounding hills, pastures and woodlands and incorporated the best environmentally sustainable practice. This was achieved by the majority of the ground floor volume being incorporated under a large living-roof from ground level in the north to providing a glass façade and solar gain from the south. 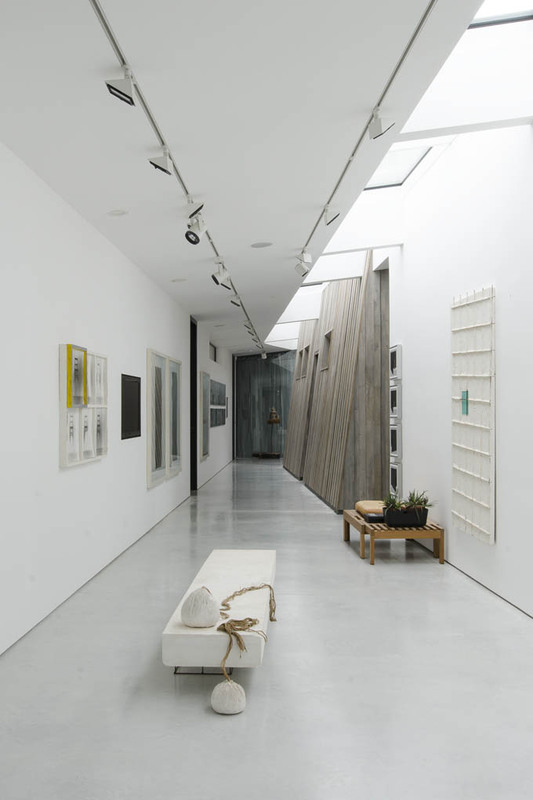 The house is organised along a long gallery space under a continuous skylight. 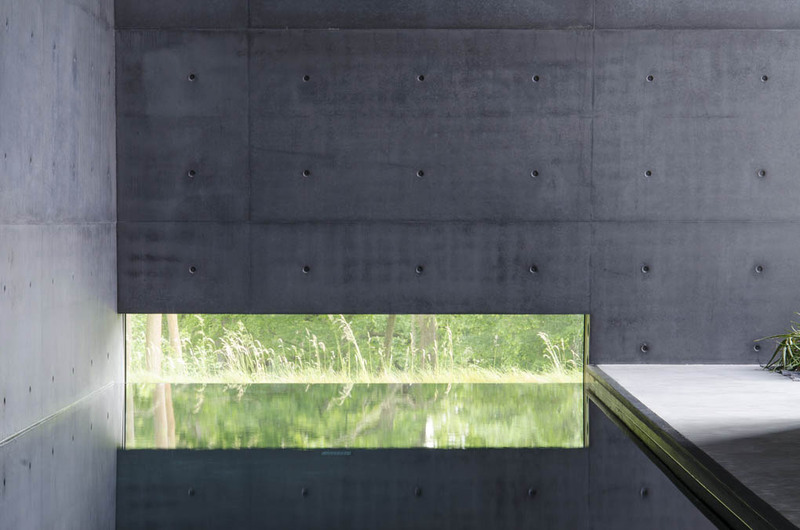 This space connects to the main open-plan living areas, the double-height studio, the bedroom 'pod' as well as the swimming pool at the end. 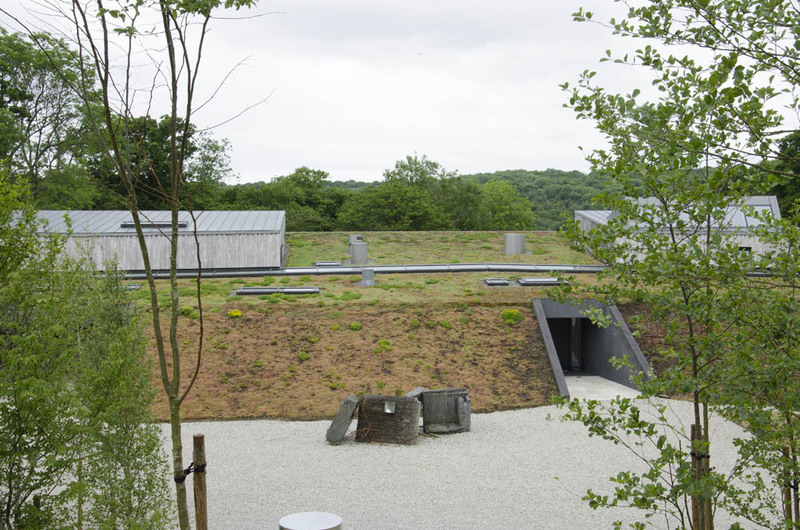 With only two wooden barn type two-storey elements protruding above the sedum roof the challenge was to provide sufficient natural light to the north, east and west of the building to avoid dark internal spaces or the need for artificial lighting. This was achieved by the use of daylight modeling to accurately determine potential problem areas and to design the provision of embedded skylights in the sedum roof, which provide a soft northern light with the glazing hidden from external view. 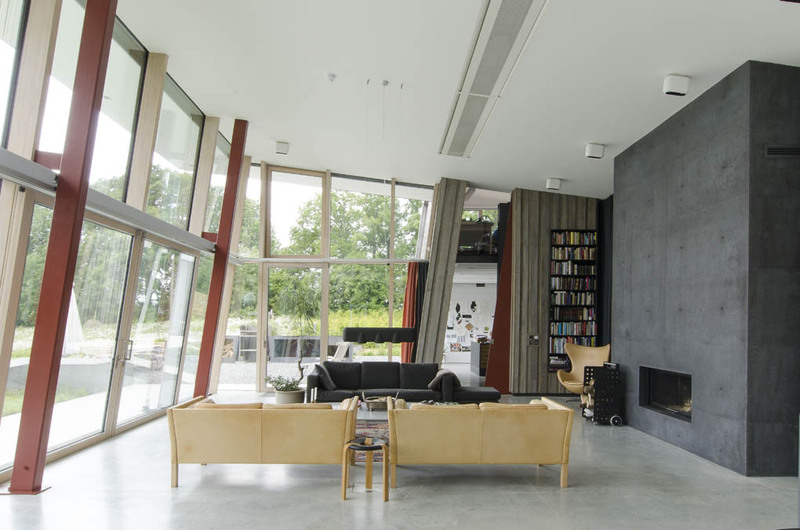 The house is based on PassivHaus principles and uses the best available North European technology. The design was focused on minimum thermal loss with a designed heat load limit of 10W/m2. Extensive thermal modeling was carried out using dynamic modeling and CFD, with all strategies developed accordingly. 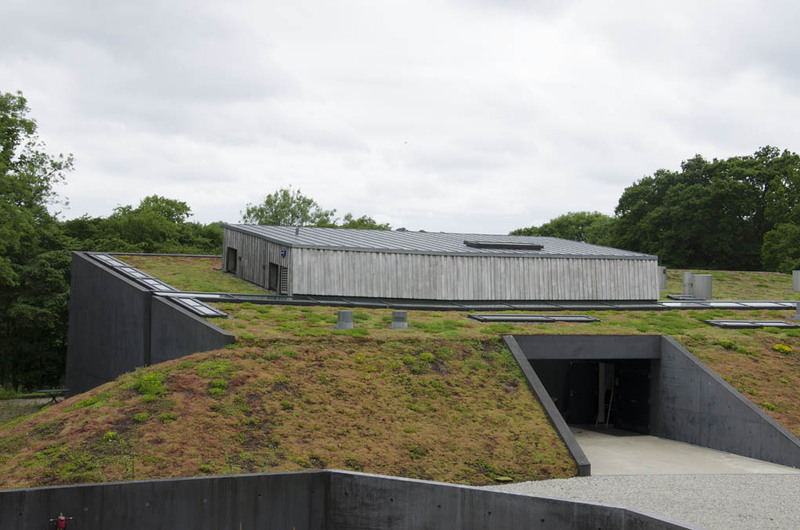 Triple glazed windows and doors were largely designed in to the South facing side of the building with the North, East and West protected by deep clay banks sown with Sedum to blend in to the landscape. Air tightness was a primary consideration and as a result of very good detailing and craftsmanship the air permeability test exceeded the required performance and complied with PassivHaus standards, as airtightness of 0.6 m3/(m2.h)@50Pa was achieved. Heating throughout the house is underfloor using low grade heat provided by ground source heat pumps connected to 1.8 kms of horizontal underground pipes at 1.2 metres depth. Domestic hot water is heated through a combination of solar panels and ground source. Additional heat is provided by a biomass stove in the living space with hot air ducting though the space. Mechanical ventilation with heat recovery (MVRH) ensures regular replacement of air while recovering in excess of 90% of the energy from the extracted air. Summer cooling is provided first by natural wind and stack driven ventilation, with the considerable thermal mass of the building used to store night time cooling. The ground source heating array is also used to provide additional cooling simply by passing the ground source water (at a constant 14 degrees) through ceiling mounted fan coil units without using the heat pumps. The building is designed to provide good availability of natural light throughout the day, so that minimum electricity usage is required. The original scheme incorporated a wind turbine, but further investigation and evaluation established that base line electricity would be better provided by PVs with a capacity of 10.26 kWp, which were subsequently introduced as a replacement for the turbine. 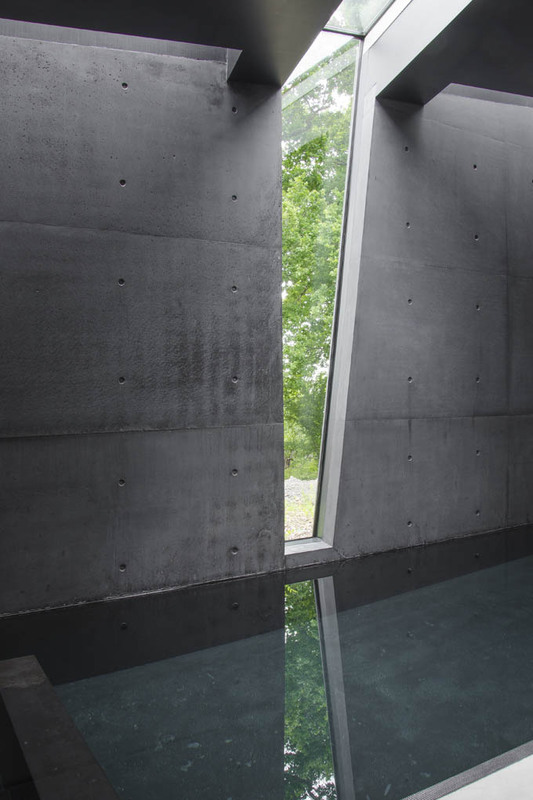 The design also incorporates grey water recovery. A waste water treatment system has been installed which incorporates a novel reed-bed based drainage dispersal unit into a purpose planted mixed woodland To reduce the embodied energy in the building much was constructed using locally produced and renewable materials, such as finger jointed sweet chestnut, ragstone and recycled clay dug out from the foundations to construct the north facing banks. 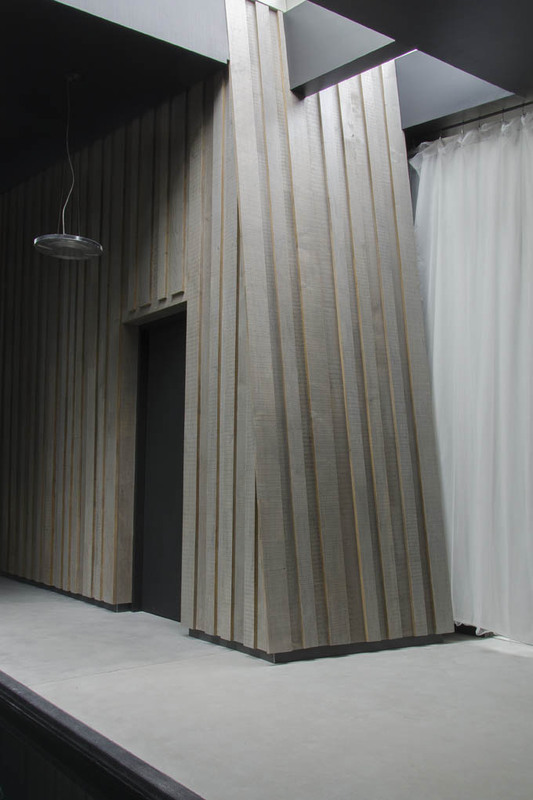 Wherever possible, eco-friendly materials were used such as wood fibreboards instead of plasterboards and lime plaster and locally sourced timber for both external and internal cladding. Initial sedum roofing material was provided from Holland, but subsequent roofing was sown with sedum grown on site from the initial stock.